About a month ago Alisa from One Frugal Foodie posted an oat waffle recipe. It wasn't so much the recipe that caught my eye, but her tip to cool the waffles and freeze them for breakfasts on the go. Uh.. duh! Another one of those simply genius ideas we seem to overlook until somebody else points them out for you. My mom used to make a bunch of waffles or pancakes on the weekend and we stored leftovers in the fridge and heated up quickly in the microwave or toaster for school morning breakfasts. We never froze them since they were eaten up so quickly. Since the idea never occurred to me, for some dumbass reason I've been wasting my money buying frozen waffles at the store when I have a waffle maker sitting in my pantry! I didn't use a waffle recipe, just Bisquick (which is dairy free in case you didn't know!). I made four batches of batter according to the instructions on the side of the box. Each batch was dressed up in its own unique way. This was the first time I'd ever used my waffle maker to make waffles! The plates come out and are double-sided. One side is to make waffles and one is flat. You can use it like a panini press, but it also unhinges and opens flat like a griddle, which is the only way I'd used it before. The first waffles of batch one were unfortunately sacrificed to the waffle maker. I didn't let it heat up properly. See? This little light was put there for a reason, not just decoration! What a mess! I had to chisel some parts out of the grooves! But after I let it heat properly, it started working like a champ and I was able to turn out batch after batch, perfectly! After spraying both waffle plates, scoop the batter into the center. Close the lid and leave it alone for about 5 minutes, or until steam stops billowing from the sides. Carefully raise the top, remove the waffles with tongs, and start over! Let the waffles cool on a wire rack and then separate and put in labeled freezer bags. When ready to eat, simply pop them in the toaster just the same as you would an Eggo! All four of these batches yielded me almost 40 waffles. I used less than one box of Bisquick, a little over a quart of milk, 1/2 cup of oil, and 4 eggs, which is a steal when you do the math! You can also control the ingredients and nutrition based on your allergies, tastes, and dietary needs with no funky preservatives or mystery ingredients. I also received another award! 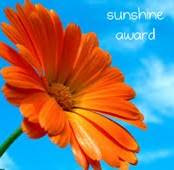 Gina at Simply Life gave me the Sunshine Award! Thanks, Gina! I'm going to pass it onto two of my favorite bloggers, who are also really great friends. Laura of Hey, What's for Dinner, Mom? who was instrumental in my developement of Friday Firsts. She was the first person I told about it way back in December and gave me the guts to go forward with the project! Incidentally, she's going to be starting "Just another meatless Monday" every Monday for you to link up your vegetarian or vegan dishes to share! Sophia of Burp & Slurp who really jumped on board and helped with the launch of Friday Firsts by posting about it and linking up immediately, with no hesitation! That's support! That is a great idea, I always freeze leftover waffles but there rarely are many leftover! WOW! Ok I love the idea of chocolate chips in waffles! And the award? is fabulous! Thanks so much, I feel blessed to call you a friend too. I would never in a bajillion years have thought that I would feel like I know someone I have never met before! It's such a great benefit of blogging, and the internet in general, to meet people who are complete strangers and yet I feel so comfortable talking with them. Christina you are a true friend and I can't wait meet you in person! Love you! Can I get a few more exclamation points in there??!!?!?!??!! I always make a double batch of waffles to freeze - such a good snack on my way to school. Fyi, eating a pb covered waffle while biking is massively difficult, lol. I like to add pumpkin and spices sometimes too! And applesauce! You have a waffle maker!!! Bye bye, frozen waffles! And boy, that is a lot of tasty looking golden waffles!! I used to work in Cold Stone Creamery and I LOVED making the waffle cones...I would sometimes purposely mess up so that I can eat the "mistakes"...lol! And aw, thank you for the award! I feel like a broken record saying thank yous all the time, but thank you....times a million! p.s. How did you and LAura NOT meet up yet? Don't you live kinda close? Ally yours sounds like Belgian waffles! Errign pumpkin sounds delicious next time! I was wondering about apple sauce, but wasn't sure if it'd make it too watery, so stuck w/ apples. I'll have to get brave next time and try! I make extras too and freeze them. So so so simple later in the week that way, I love it. We pink puffy heart Bisquick! Yayy to your wonderful blogger friends. :) You are such a loveable person Christina!!! I'm not sure what "grade" of waffle maker mine is. My mom got it at a thrift store in NY I think hehe. The brand says Bowman-Manning if anybody was interested in trying to find a similar one! oops I transposed. It's Manning-Bowman! lol i love your sacrificed waffles, i hope you saved those to use as an ice cream topper!!!!!!! lol just kidding..
no those look awesome, i need to get some waffle mix! btw the word verification is "shilin", am i chillin or what!!?? Wow, that is a super saver method! A waffle iron is probably the ONLY kitchen gadget I don't have! wow these waffles look like the perfect start to any day! I have no idea why your link to Crock Pot Wednesday disappeared. Please come link it up again I never got notification that it was there. HMMM. Sorry. I really do appreciate the link. I love frozen waffles, and yours sure turned out great!